You’re in for a treat – Princess Nagger is interviewing me today about my Summer Beauty Tips! This fun post was brought to you by the Venus Embrace razor (thanks Venus! ), which was provided to me for free. My favorite feature is that there are 5 blades plus a Ribbon of Moisture to help minimize nicks and cuts. That makes me feel much better! Check out Kendall and Kylie Jenner with your daughters here on Venus’ Facebook page here. There are also some more great summer tips from Venus here. So, now it’s your turn! 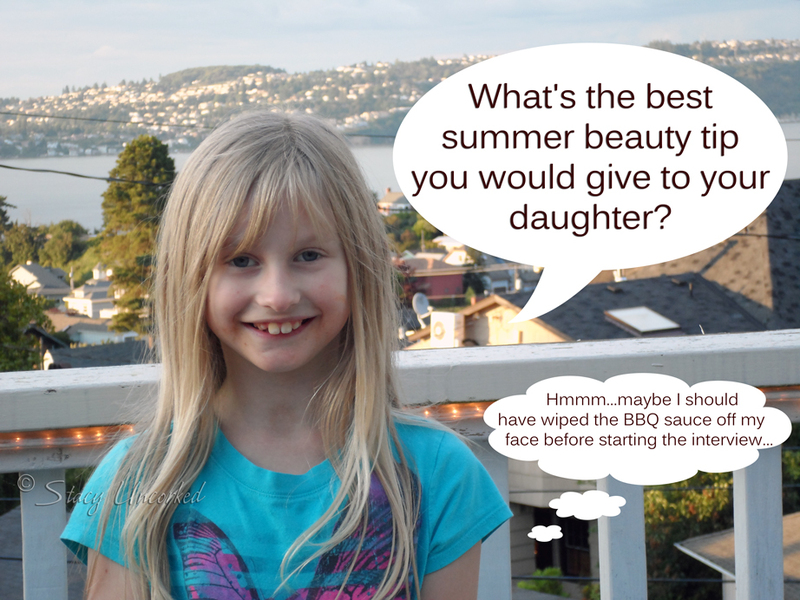 To enter to win a $50 Visa Gift Card, tell me in comments, What’s the best beauty tip you have shared with your daughter to prepare her for the summer? Or share your funniest beauty mishap – Princess Nagger wants to know! This sweepstakes runs from 7/26 – 8/23. Be sure to visit the Venus brand feature page on BlogHer.com where you can read other bloggers’ reviews and find more chances to win! Have you checked out the Life Well Lived section of BlogHer.com? There are some great tips and expert posts on everything from Looking Your Best to Getting Happy and Getting Organized! This entry was posted in Giveaway, Review and tagged beauty tips, disposable razors, freckles, Gillette, Giveaway, lemon juice, Princess Nagger, Review, summer beauty, sun block, Venus by Stacy (the Random Cool Chick). Bookmark the permalink. Super cute! Maybe she has a career in journalism ahead. 🙂 I hate disposable razors too btw. BRUTAL! I do not have a daughter, and I am very sad that I won’t be able to pass on any beauty secrets. But your daughter is so pretty that she made me smile! Haha, that was most fun! Tip: Drink the water. I promise it’s really good from the inside out in helping your skin. Always use sunscreen! You will thank me later. Best beauty tip is to drink alto of water, and watch out for the bad and greasy foods! Always wait to apply sunscreen. Your body needs SOME UV to synthesize Vitamin D.
My mother always said to moisturize and wear sunscreen wheenver you’re outside. My best beauty tip – always remember to wear sunscreen. It’s just a simply step daily but goes a long way to keep your skin healthy. My mother always emphasized the importance of wearing sunscreen. She has really great skin so I’m listening to her! My best advice is to wear sunglasses all the time! Macular Degeneration runs rampant in our family.. it is hereditary. I’m with you on the freckles; hated them as a kid and now I love ’em! My funniest mishap was this one time when I followed a magazine article and used a mayonaise hair mask. It was gross and so hard to wash out! My funniest beauty mishap was when I rubbed my eye and mascara ran and my son thought someone gave me a black eye! Always wear spf & moisturize! I like to rub my legs with a pumice soap or stone before I shave them. I put on makeup that doesn’t match my skin color to try to cover up my acne, didn’t look good and probably irritated the acne too. Thanks for the tips and giveaway. I do not have a daughter to share with but one secret I have learned about keeping your hair shiny is when you wash the last rinse should be with very cool water, it helps get the soap out and cool water closes the hair cuticles up to make it smooth and shiny. Put lots of sunscreen on! My best advice is to keep blotters in your purse for wiping off excess oil, especially during the teen years. SAVED MY LIFE in high school! When we were younger my sister stole my liptsick and smeared it all over her face, and she thought she looked pretty. It was too funny. My only tips to my daughters are to wear what makes them feel good. Always pluck your eyebrows and use moisturizer. Always use sun screen even if your skin is naturally dark. Dark skin is no protection against the sun.